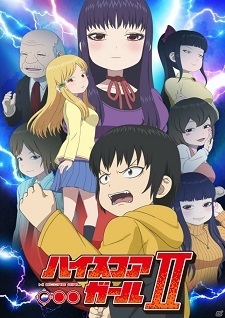 A second season for High Score Girl TV anime was announced during the Extra Stage OVA screening event on Thursday. Titled High Score Girl II, the anime is slated for this fall. The staff and cast members will reprise their roles. Rensuke Oshikiri penned High Score Girl in Big Gangan from October 2010 to September 2018, compiling it in ten volumes. The manga entered hiatus when it received a copyright violation for featuring characters from games without permission, which also delayed its anime adaptation that was initially announced in December 2013. The TV anime aired last summer and the three-episode Extra Stage was released as a separate volume and via Netflix on March 20. Good to hear. Got get him Hidaka. If it follows manga Hidaka will lose and Oono gets him. It's not like it's not obwious that the guy loves Oono not Hidaka. Great news! I can't wait to see more of this series! I freaking love this show. Easily in my top 5 romance anime. I hope they adapt everything left. well this is the show I really should have forced watched back when it was airing instead of reading the manga. Didn't expected there will be 2nd season. Even if i usually hate CGI this anime was a gem and also the manga. So many retro feels! Happy that they are making second season. If you haven't seen it, you are missing out. I wonder if they cover last chapters as well? Even though I wasn't as crazy about it on my second viewing, I'm still pretty excited about this; it's a cute smol romcom and though the love triangle is a little much it didn't ruin it for me. Damn good news. I was gonna start the manga, but there seems to be no reason to do that now. Manga usually has more game and hardware info not fitting in the TV adaptation but sometimes it gets too descriptive and encyclopaedic. As a video game enthusiast I was aware of those games anyway. Anime has better balance and is as enjoyable. Ah, then I might give the manga a read once all of its chapters get translated. Gladly will take a s2/complete adaption after watching the OVA. Excited to see what happens and how the relationships will grow. Didn't really expect this to happen. But when Baki and HSG are both receiving second seasons then I guess you have no right to complain about the death of anime. Would probably pick the second season up aswell. It was an ok anime. Not bad for being a triangle romcom, but not great iether. Good, almost started reading the manga after the OVA. Will watch this one if the scanlations take longer and longer to finish it. Knowing you, that's a pretty weak reason coming from you. Considering the fact that Oono beat the living daylight outta Haruo throughout the entire season 1 lol! I thought the OVA ended the story! I never expected this to get a sequel! AND THEY SHOWED KAISER KNUCKLE!? AND IT'S COMING THIS FALL? LET'S GO!!!! Also, funny how the key visual reflects Street Fighter lol.